Don't worry! You are Just in Time for the last career & internship fair of the academic year. Come prepared with professional attire and copies of your resume. 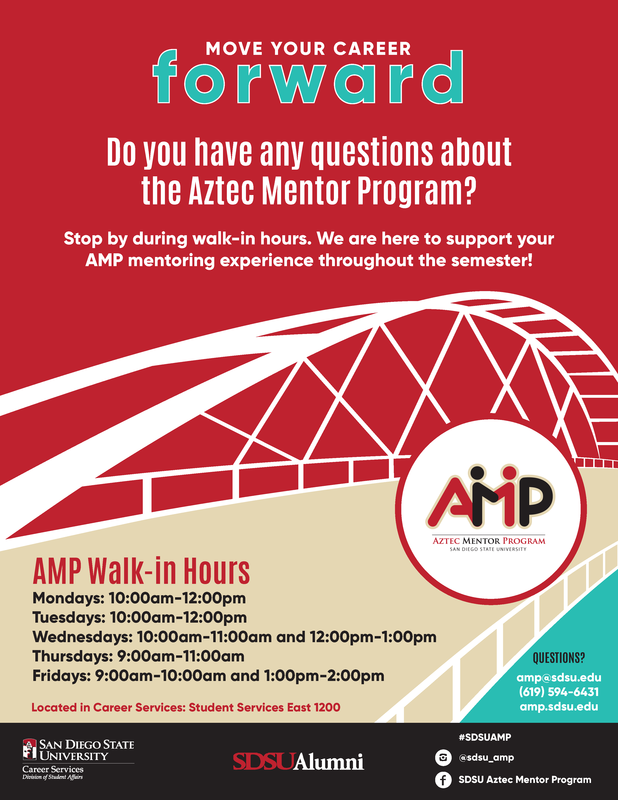 Come in with any questions you have about the Aztec Mentor Program, all semester long! In-depth intelligence on what it's really like to work. Search jobs & internships, research companies, & find the career advice you need to launch your career. Free to SDSU students! Looking for an internship/employment in accountancy post-graduation? Check out the timeline & guidelines, resume guide & prep workshops for help with job searching, interviewing & networking! See these tips from us and the FBI about job scams targeting college students. If you have any questions about any job, call us at 619.594.6851. 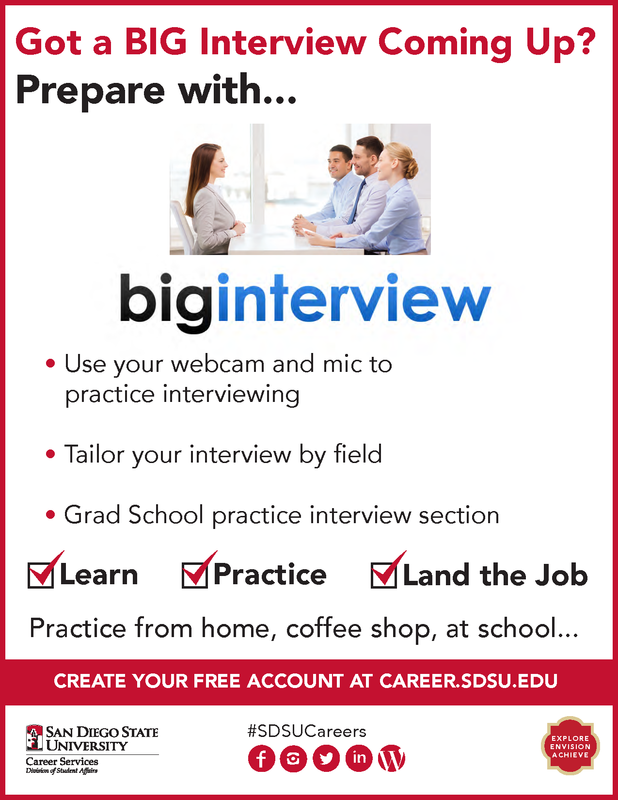 Got an interview coming up? Use our free online interview practice tool to practice and improve your chances of landing the job! Download Symplicity Jobs & Careers for iOS or Android to access Aztec Career Connection anywhere, anytime. Your profile, jobs & interviews, events and more are all at your fingertips! Good things happen when Aztecs hire Aztecs. Watch this profile of one such successful experience! Online access to a huge variety of jobs, assessment tools, internships, interviews, & more. Aztec Alumni are employers, job seekers, mentors & SDSU Career Services partners. We can connect you with your next opportunity! This popular & successful program is your window into the world of work. Tools for students, employers, faculty, staff, alumni, & parents to create successful internship experiences. We host career fairs, info sessions, workshops, & other career development events throughout the academic year. SDSU Career Services connects you to our diverse, enthusiastic, & innovative students & alumni. Appointments: available 9 AM - 3 PM, at least 24 hours in advance. Call or come in to schedule.